Our tracks are optimized for every space and situation. Small booth, ballroom or parking lot; indoors or out, our batteries or your power. Wireless microphone and video monitors can be linked to multiple displays or larger sound systems. We can provide specific types of cars and brand everything by request. Custom designed tracks are also possible. All are interactive fun, delivered and operated by our professional Race Directors. Our premium track. With it’s impressive size, 360 degree video monitors, and strong sound system, it can be a centerpiece of any celebration or competition. Races of any duration for 4 or more participants can be scored accurately. Options include in-car cameras for real time display on remote monitors. Minimum space required is 12’ by 22’. 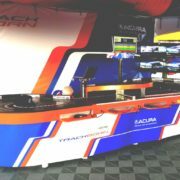 Can be transported to events in our truck or crated to travel with your event package. Our most popular track. Optimized for a rapid series of short races for up to 6 players at one time. 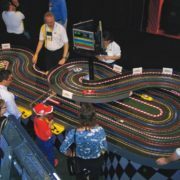 This versatile track can attract and engage in high traffic situations or provide hours of addictive entertainment for smaller groups. It’s fast setup and operation by a single Nomad team member is very cost effective. 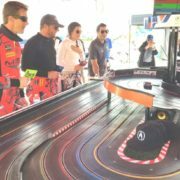 Up to 10 cars can run at once including 4 auto pilot cars, adding to race excitement. The oval format makes it easy for beginners, but the ability to switch lanes and pass slow autopilot cars guarantees satisfied racers. Crashes are just part of the fun! Cars can also cruise between active races. Minimum space for operation is 10’ by 18’. All of the features and advantages of Nomad Oval Speedway in a package small enough to travel worldwide as checked baggage. On arrival one Nomad teammate assembles this raceway on existing or locally supplied tables. This modular approach cuts logistics costs and also allows more size flexibility. Standard size requires four 6’ by 30” banquet tables arranged 12’ x 60”, but larger or smaller variations as small as 6’ by 30” are possible. 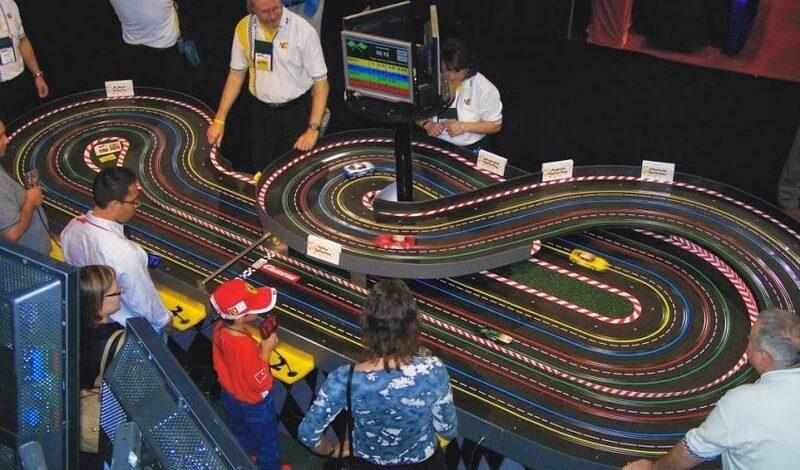 This realistic, scenic track with it’s challenging course is a real treat for a small gathering of enthusiasts or an attraction at larger events. Minimum space requirement 6’ x 9’. 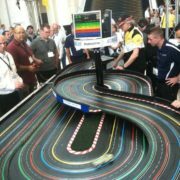 A small example of the type of track that we custom build for corporate, private enthusiast or club use. Ask for details! 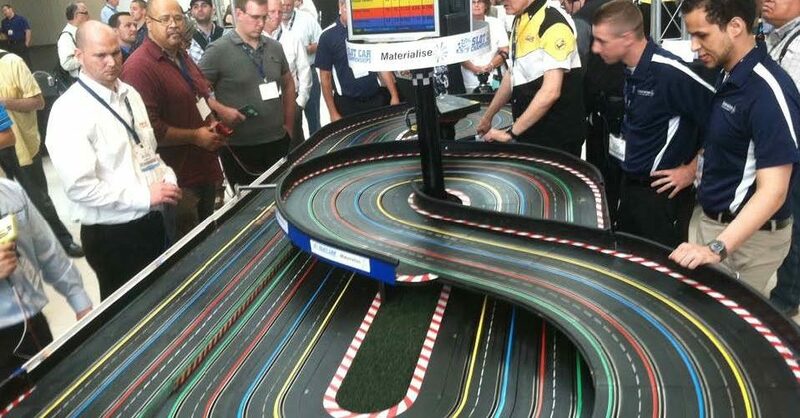 Using the very latest in slot car technology, this sinuous track replicates elements of motorsports including drafting, switching lanes to pass, pit stops and “fuel” management strategies. Up to six drivers at one time can race for any duration. Kids, adults, first timers or enthusiasts all love this track! Results can publish automatically to your Facebook page! 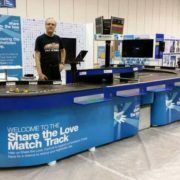 This track will fill a 16’ x 24’ space with excitement! A large traditional 8 lane Commercial track. Impressive size and super fast cars. This updated version of the 1960’s classic style handles competitions for any number of individuals or teams of 2 to to 8. 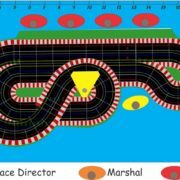 Quickly converts from high speed tri-oval to twisty road course for two levels of challenge. A huge selection of custom cars is available. 30’ x 45’ size. 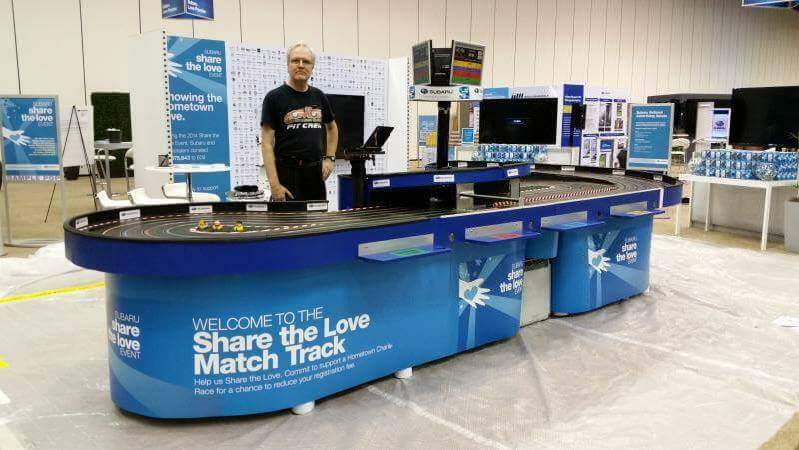 With just a just 5’ x 2’ footprint and near instant set up this little track brings excitement to any small space. Cars are smaller too, but the fun is huge!